Salt Lake City is the capital and the most populous municipality of the U.S. state of Utah. With an estimated population of 190,884 in 2014, the city is the core of the Salt Lake City metropolitan area, which has a population of 1,153,340. 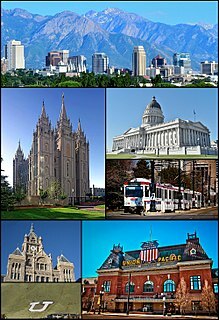 Salt Lake City is further situated within a larger metropolis known as the Salt Lake City–Ogden–Provo Combined Statistical Area, a corridor of contiguous urban and suburban development stretched along a 120-mile (190 km) segment of the Wasatch Front, comprising a population of 2,423,912. It is one of only two major urban areas in the Great Basin. The ISU Speed Skating World Cup is a series of international speed skating competitions, organised annually by the International Skating Union since the winter of 1985–86. Every year during the winter season, a number of competitions on different distances and on different locations are held. Skaters can earn points at each competition, and the skater who has the most points on a given distance at the end of the series is the winner. Initially not very popular with skaters nor spectators, the World Cup has gradually become more and more popular, and this was due to the creation of the World Single Distance Championships. The results of the separate distances in the World Cup ranking are the main qualifying method for the World Single Distance Championships. The women's 500 metres speed skating competition of the 2010 Winter Olympics was held at the Richmond Olympic Oval on 16 February 2010. The 2010 Winter Olympics, officially known as the XXI Olympic Winter Games and commonly known as Vancouver 2010, informally the 21st Winter Olympics, was an international winter multi-sport event that was held from 12 to 28 February 2010 in Vancouver, British Columbia, Canada, with some events held in the surrounding suburbs of Richmond, West Vancouver and the University Endowment Lands, and in the nearby resort town of Whistler. Lee Sang-hwa is a South Korean speed skater who specialises in the sprint distances. She is a two-time Olympic champion in 500 metres and the 2010 World Sprint champion. She is the current world record holder in women's 500 metres with the time of 36.36 seconds set in Salt Lake City on 16 November 2013, and also holds the South Korean record on 1000 metres. She has also won three World Championships medals in 500 metres, and has placed in the top three in World Cup events four times in this distance. Her first World Cup victory, however, came on the non-Olympic distance 100 metres. On the 1000 metres, however, she has never placed higher than fifth in international events. Bonnie Kathleen Blair is a retired American speed skater. She is one of the top skaters of her era, and one of the most decorated athletes in Olympic history. Blair competed for the United States in four Olympics, winning five gold medals and one bronze medal. Lidiya Pavlovna Skoblikova is a retired Russian speed skater and coach. She represented the USSR Olympic team during the Olympic Winter Games in 1960, 1964 and 1968, and won a total of six gold medals, which is still a record for a speed skater. She also won 25 gold medals at the world championships and 15 gold medals at the USSR National Championships in several distances. She was also the first athlete to earn six gold medals in the Winter Olympics and the first to earn four gold medals at a single Olympic Winter Games. She was the most successful athlete at the 1960 and 1964 Winter Olympics, sharing the honour for 1960 Games with her compatriot Yevgeny Grishin. Shani Earl Davis is an American speed skater. Tomomi Okazaki is a Japanese speed skater who has competed in five Olympic Games. She won a bronze medal at the 1998 Winter Olympics in Nagano, Japan. Okazaki was the oldest member of the Japanese team at the 2010 Winter Olympics. Jan Smeekens is a Dutch speed skater. He is a 500 m specialist. Annette Albertine Gerritsen is a Dutch former speed skater. She specialised in the 500 m and 1000 m distances, and won a silver medal in the 1000 metres at the 2010 Winter Olympics in Vancouver. She is the current Dutch junior record holder in the 500 m (38.57) and her personal best (1.16.14) used to be the world junior record. She also holds the world junior record with her Dutch teammates in the team pursuit (3.12.37). Lee Kyou-hyuk is a South Korean long track speed skater who specializes in the 500 and 1,000 meters. He was the 2007, 2008, 2010 and 2011 World Sprint Speed Skating Champion and the 2011 World Champion for 500 m. He is one of four men to have won the World Sprint Speed Skating Championships four times. Sayuri Yoshii is a Japanese speed skater. She won silver in the 1000 m and bronze in the 500 m during the 2008–09 World Cup season. She competed in the 2006 Winter Olympics and became 5th in the 500 m of the 2010 Winter Olympics. Yu Jing is a Chinese long-track speed-skater who specializes in the sprint distances. She became the World Sprint Champion in 2012, setting world records in both the sprint combination and the 500 metres. She held the world record in the sprint combination until Heather Richardson bettered it in January 2013, and the world record in 500 metres until Lee Sang-hwa broke it in November 2013. The time, 36.94 seconds, was the Chinese record until broken by Zhang Hong in November 2015. Nao Kodaira is a Japanese long-track speed skater who specialises in the sprint distances. Mo Tae-bum is a South Korean speed skater. He is the 2010 Olympic Champion and the 2012 and 2013 World Champion in 500 m. He started speedskating while in the third grade. Prior to the 2010 Winter Olympics, Mo won two distances at the 2006 World Junior Speed Skating Championships. He has competed on the national level since 2004 and has competed internationally since 2005. The men's 500 metres speed skating competition of the 2014 Sochi Olympics was held at Adler Arena Skating Center on 10 February 2014. Michel Mulder won the gold medal. The women's 500 metres speed skating competition of the 2014 Sochi Olympics was held at Adler Arena Skating Center on 11 February 2014. The women's 3000 metres speed skating competition of the 2014 Sochi Olympics was held at Adler Arena Skating Center on 9 February 2014 at 15:30 MSK. The competition was won by Ireen Wüst from the Netherlands, who previously won the same distance at the 2006 Winter Olympics. Martina Sáblíková from the Czech Republic, the defending champion, finished second, while Olga Graf won the bronze medal.